My camera and I – the fight for control. Spurred on by my recent membership of this community, which provides access to so many well-crafted photographs, I have decided it is time to get to grips with my camera. I bought my Nikon D3100 when I retired in August 2012……. twenty months on I am very pleased with the photographs I’ve taken and the outlet it provides for my creative self, but there are a number of elements of it that I have not yet investigated and which should enable me to develop my craft even further. I will just point out that I am not a complete novice – I grew up around cameras. My (much) older brother was a keen amateur photographer in the 60s and I was a frequent, and convenient, child model. I spent hours with him watching the magic of processing in a dark room, seeing the image emerge on the paper, impressed by his ability to get the timing just right. My photographic activities started with a box Kodak, progressed to a Brownie (still boxy but oval), then an instamatic – never a Polaroid, that just seemed too ‘instant’ – onto an old Pentax SLR, a digital Olympus mju300 and now, my pride and joy, the Nikon DSLR. I suppose I must have had some knowledge of the settings using the Pentax as I managed to record the events of a few years with some success, but I suspect that knowledge faded with reliance on the ‘point and shoot’ Olympus….. and this Nikon is a whole new ball game, as they say! So, yesterday, armed with my camera and its manual (not trusting myself to retain all the information I’d read in the preceding two days) I set out to remedy this sorry state of affairs. 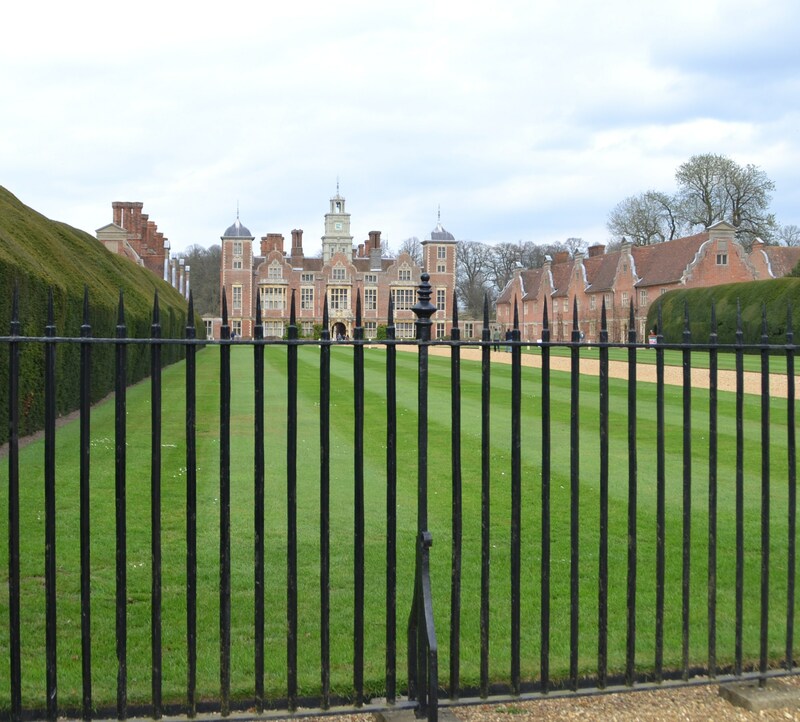 I hopped into my car and drove out to Blickling Hall, about 20 minutes from where I live. This was where my camera and I first became acquainted, in the summer of 2013, and I remember how excited I was with the results! 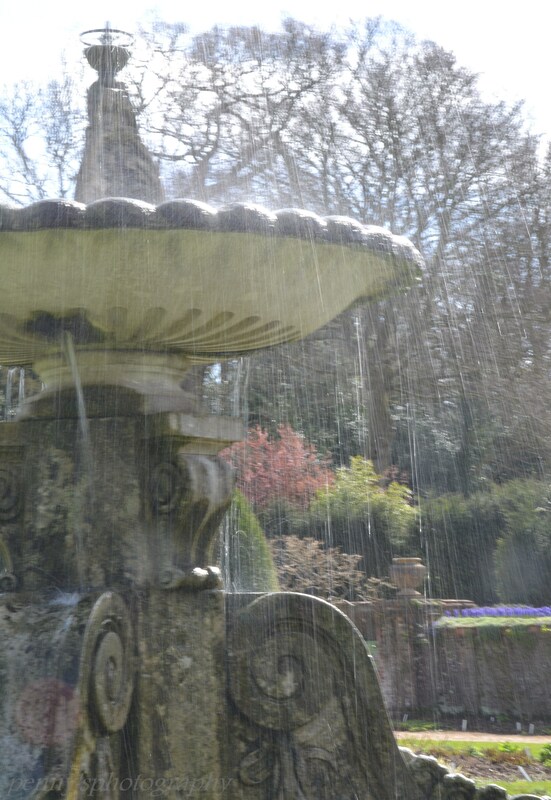 It’s a National Trust property, with open landscape, old buildings, flowers, shrubs and trees and water in various forms: ponds, fountains and a lake. So, plenty of opportunities to experiment with ‘ISO’, ‘aperture’ and ‘shutter speed’! Determined to avoid the ‘auto’ and ‘scene’ settings I set off, but where to start? Should I set the ISO for the light conditions, should I set the aperture and experiment with shutter speeds or settle for a shutter speed and vary the aperture? So many choices and always the option to fiddle with all three at the same time, but then how would I know which had been the determining factor (is that even possible)? Now I have no doubt that those of you who are seasoned (or even professional) photographers, should you be glancing this way, will already be chuckling at my confusion or even shaking your head in disbelief at my ineptitude. Am I any the wiser? Well – yes and no…… I seem to have worked out how to freeze and blur water….. I think I could do that anyway by using the auto scene modes, but now I know how to do it for myself! I discovered that when the device decided ‘subject is too dark’ or ‘subject is too bright’ I could make it obey by changing the ISO setting – although I still ended up with some very bright, and very dark, shots. As I experimented an additional problem reared its head….. it was a lovely bright day and I was wearing sunglasses. This made it difficult to read the display….. and the small print in the manual, so the specs came out…. and went back…. and came out again etc, etc…. I stopped for lunch thinking I might review my efforts so far but, as I was sitting outside, it was too bright to view them properly. Undeterred I gave up on the grounds and formal gardens and headed into the house itself, where I’d found excellent subjects for ‘still life’ shots on my previous visits. 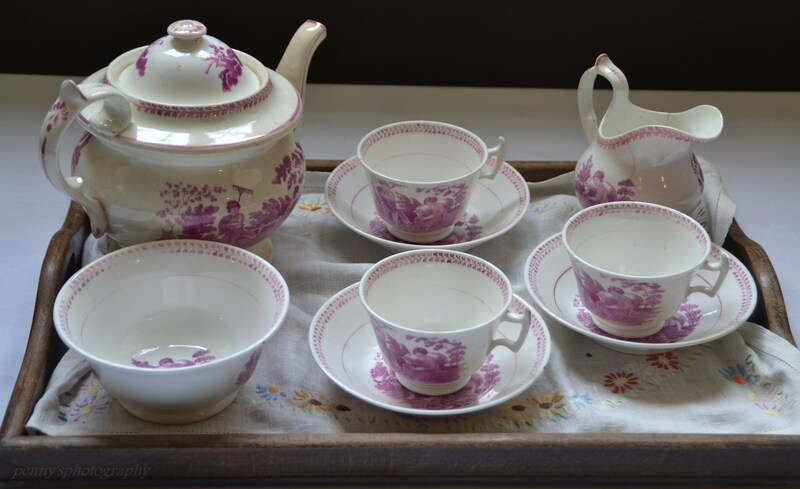 But that was a different time of year and the dried flower arrangements that had interested me before had gone, the vases of fresh flowers were few and far between and nothing really caught my eye…. 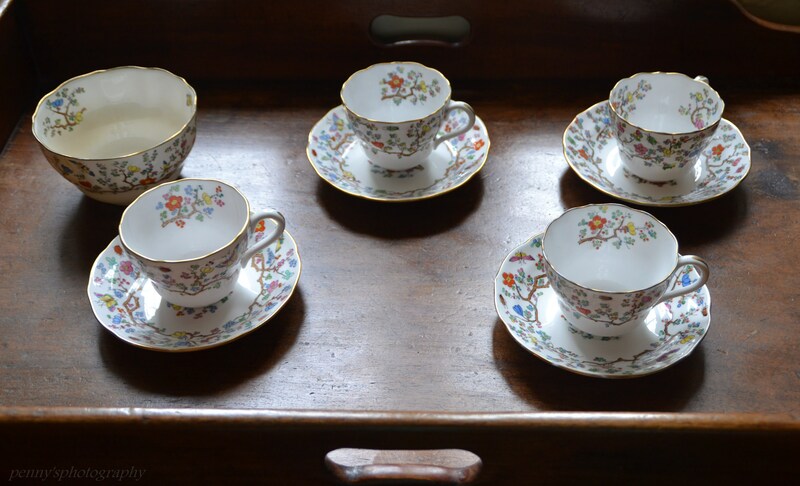 except for two trays of china tea cups in the kitchens…. I’m afraid I have to confess that the last few shots of the day were taken using the auto scene modes… yes, I know I started off determined to avoid them but I was fed up with swapping glasses and I can read the dial easily with my sunnys on, and I wanted to come away with at least a few decent shots. Do I know more about my camera? Yes – I can take half decent shots of moving water….. and I understand a little bit more about light settings……… but I still can’t bring the background into focus and I think it’s probably capable of a lot more than I am!! In addition, I’ve learnt that the ‘fix’ options on the laptop can redress a number of faults, but that’s cheating….. isn’t it?? Open to suggestions…. advice….. tips…….. I got a Canon DSLR for Christmas…2012. I’ve still not been brave enough to try anything that’s not automatic. Perhaps I should get a bit braver and just experiment. The worst that’s going to happen is that I hit the delete button an awful lot, right? Lovely shots today. I really like the different water effects. I can’t wait to see your progression. That’s one of the joys of digital photography and yet I still have an awful lot of sub-standard stuff stored on my laptop. I deleted quite a few yesterday – totally black shots to completely white ones and some where nothing was in focus at all! Thanks for the encouragement – and I hope you find the courage to experiment! None of it is cheating in my book. The artistry is in the eye. However you create that is the art. I suppose that’s true. I often reject shots that have been ‘fixed’ in favour of the original or choose to modify them slightly according to my own taste. As that’s how I judge the visual world – yes!